Presenting gifts to the bridesmaids is a great way for the bride to say thank you to them for all the help and support they have provided during the run up to the wedding and on the big day itself. Giving bridesmaid jewellery gifts is always a good option as they will last forever and will remind the bridesmaids of that very special occasion. Should all bridesmaids have the same? Whether you should give the same piece of jewellery depends on how old your bridesmaids are and how many you have. If your bridesmaids are adults or teenagers the pieces of jewellery you buy them should be alike in style and material, and should cost approximately the same, but you should also try to match your choice to their individual tastes. You could buy a maid of honour a more expensive piece of jewellery as she will have contributed more to the wedding. 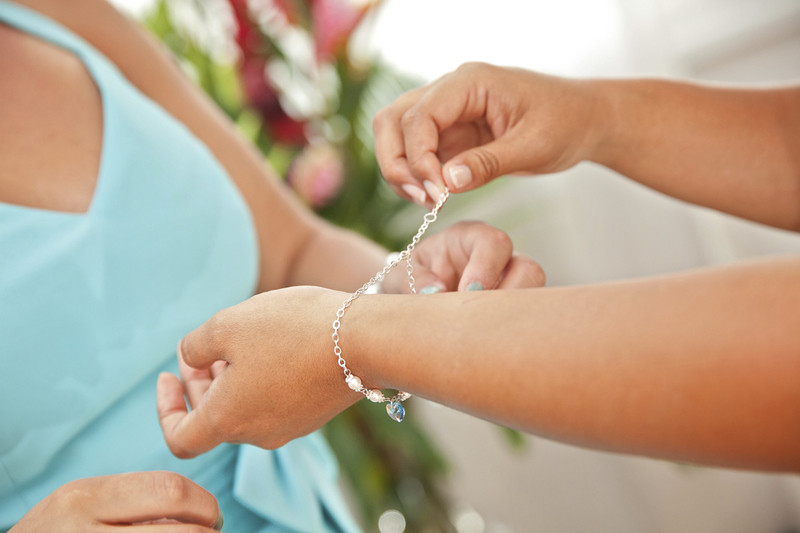 If you are having young bridesmaids, giving them all the same jewellery will prevent squabbles so this is undoubtedly a wise idea. When should I give bridesmaid jewellery gifts? Ideally you should give gifts of bridesmaid jewellery on the morning of the big day when you are all getting your hair and makeup done. If you do decide to do this you should inform your bridesmaids that you will be supplying jewellery or they may purchase their own. Make the present more of a surprise by giving it during the final bridesmaid dress fitting so that it can be tried on with their outfits. Is jewellery too obvious as a bridesmaid gift? While buying bridesmaid jewellery gifts to say thank you is quite commonplace, your bridesmaids won’t regard your gesture as clichéd. As long as you consider the bridesmaid’s individual style and preferences bridesmaid jewellery can be a very personal gift; one that can be worn for a years to come, not just on your wedding day. Do I get a single piece of jewellery or a set? What if I don’t want to give jewellery? If you’re not keen on the idea of bridesmaid jewellery gifts you could choose a handbag or a pretty purse to enhance the bridesmaids outfit. These could be embroidered or customised in some other way. If you don’t know your bridesmaids that well, perhaps if you are having sisters of your fiancé, look for luxurious bath products or choccies and have them wrapped in an attractive box with a ribbon in your wedding colour. For bridesmaids you know very well such as best friends or sisters, think about a photo album with pictures of the two of you throughout the years. Leave free pages for wedding pictures and future events.